A steakhouse-quality supper ready in 10 minutes! A steakhouse-quality supper ready in 10 minutes! right at home here, and it illustrates our philosophy of satisfaction and eating what you love. You can eat steak while losing or maintaining your weight. It’s all about moderation and balance. steak. Here we use an herbed blue cheese to achieve the same effect. 1. Preheat the oven to 375° F. In a small bowl, combine the blue cheese and parsley and use a wooden spoon to loosely work into a paste. Cover and refrigerate. 2. Spread the cracked peppercorns onto a plate. Pat the meat dry and roll in the peppercorns to coat on all sides. 3. Place a cast-iron skillet or heavy-bottomed ovenproof sauté pan over moderately high heat. (Do not use nonstick cooking spray or any type of oil to prepare the pan.) Once hot, place steaks into the dry pan and sear the top and bottom of each steak (see Note), 1 to 2 minutes per side. 4. 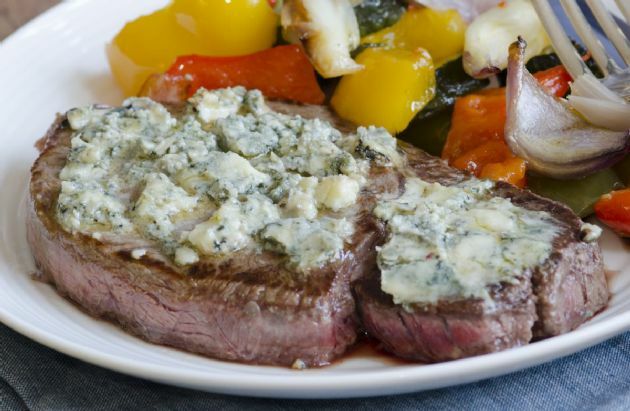 Place 1 tablespoon of the blue cheese mixture on top of each steak and transfer the pan to the oven. Roast 6 to 7 minutes for rare, 7 to 8 minutes for medium. easily once completely seared; any resistance and it’s not done yet. You're correct. We used three tablespoons of blue cheese, but then we add to it a quarter cup of chopped parsley. They final volume for the HERBED blue cheese is four tablespoons or so. That nutrition info is correct.